Did I finish? : Yes, and this time, I raced through it because this was potato chip-level of delicious. One-sentence summary: Jane Austen's Persuasion from Capt. Wentworth's point of view, continued from the events in Lyme. Why did I get this book? : My Austen challenge plus I've a giant crush on Wentworth, and this is the sequel to None But You. Do you like the cover? : Yes, and while subtle like the first, I think this cover better represents the plot than the cover to None But You. First line from book: Louisa insisted on standing and even took the few steps to the window. Do... I wish Kaye would write a book about Wentworth's siblings? : Yes! I've always been partial to Sophia Croft, especially Fiona Shaw Sophia, and Kaye's articulation of both Sophia and elder brother Edward is just wonderful. Am... I contemplating writing Kaye a fan letter? : Yes, although I'm not sure what I'll say other than 'Dear Ms Kaye, your books are made of awesome and so are you'. Did... I about die of joy when I discovered there's going to be a third book? : Ohmygosh, yes. Praise higher powers for that. Review: I read this book in at least half the time of the first, and I think it's because there's so much original plot in this one. Unlike None But You, which is almost scene-for-scene of Persuasion (right down to the dialogue), Kaye has to fill in the details of Wentworth's activities after the disastrous event in Lyme. While Anne and her family goes to Bath, Wentworth is on his own, and Kaye easily fleshes out Wentworth's family. In None But You, the reader is sort of holding their breath, wondering how Kaye will handle the scenes and characters we readers are so familiar with. I think that's why my reading was so slow. 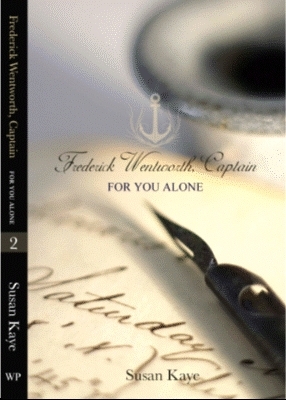 In For You Alone, I had no apprehension that there might be a wrong note -- Kaye already proved her Austen competency, and when it came to her original plotting regarding Wentworth, it was engaging and felt authentic. There was a different feel to this book than the first in terms of tension, and again I suspect it's due to the change in plot and focus. None But You is fraught with the tension of Anne and Wentworth's reunion and the reader's knowledge of what is to come. In For You Alone, Wentworth (and the reader) freed from the carefully controlled dance of society and I think everyone breathed a bit easier. The only misstep for me was the very abrupt change of focus that began at Chapter Fourteen. With no notice, the point-of-view changed from solely Wentworth to that of Wentworth and Anne; finding myself in Anne's bedroom as she and her maid prepared for the night felt very sudden and abrupt. I wished Kaye had done something to indicate this shift in direction, perhaps a Part I and Part II, something like that.